For my creative Textiles city and guilds final piece I decided to make a fabric book. It all seemed a bit daunting at first but I soon got into all the different techniques . One of the inside pages, hand dyed scrim over velvet with hand embroidery. 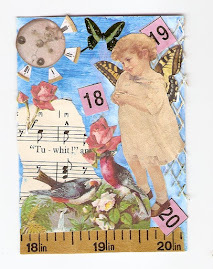 I enjoyed playing with the fabric on this page and after weaving I added some found objects.